Wildfires tore through northern California’s iconic wine-growing regions of Napa and Sonoma, damaging some of the most valuable vineyards and wineries in the U.S. and leaving vintners dumbfounded. 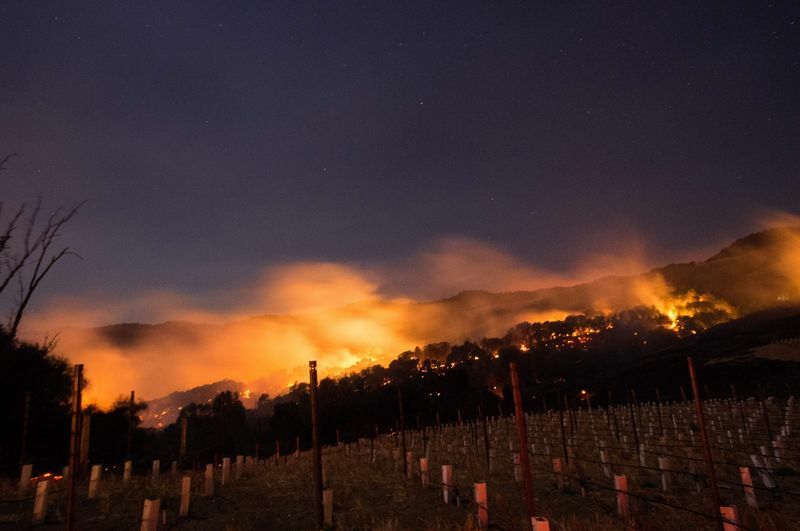 “We are all in shock and trying to help our fellow growers and neighbors where we can,” said Heidi Soldinger, a spokeswoman for Napa Valley Grapegrowers. While California’s coast accounts for a relatively small percentage of U.S. production, it is the most valuable region in the country, said Stephen Rannekleiv, a beverage analyst at Rabobank International. The lion’s share of grapes in the state are grown in the San Joaquin Valley, where cabernet sauvignon grapes go for about $400 a ton. By contrast, the same fruit from Napa Valley usually costs closer to $7,000 a ton, and can sell for as much as $50,000. High-end wines are driving demand growth in the U.S., with bottles priced over $10 seeing the biggest gains, Rannekleiv said. Six fires were simultaneously raging across the region on Monday afternoon, covering a total of about 60,500 acres, according to the California Department of Forestry and Fire Protection. None of the blazes had been contained as of 2:40 p.m. local time, CalFire spokesman Will Powers said by telephone. The fires tripped several high-voltage power lines and left about 99,000 utility customers without power as of 4:30 p.m local time in Napa and Sonoma Counties, according to PG&E Corp. 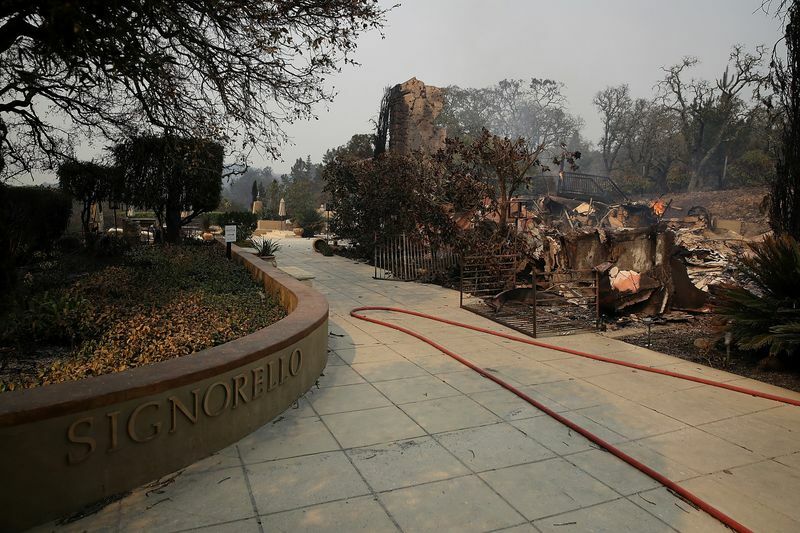 The utility also turned off gas service to about 26,000 customers in Santa Rosa, Yountville, Napa and Kenwood, spokeswoman Andrea Menniti said in an email statement. Parts of three counties — Napa, Sonoma and Lake — have been evacuated. It’s too early to tell the scope of the fire and the extent of the damage to the area, although pictures flooded social media showing burned down buildings. Paradise Ridge Winery in Santa Rosa was among those that burned down, according to a Facebook post. The harvest in Sonoma and Napa counties is mostly finished, said Daniel Sumner, an agricultural professor at the University of California at Davis. Still, fires can damage any grapes yet to be collected and can also destroy the vine plants and wineries, he said. “It’s bound to be a significant and substantial impact on the high-quality wine industry,” Sumner said. Sonoma County Winegrowers estimates that 90 percent of the county’s crop has already been harvested, but there are still winegrapes that were scheduled to be picked in the next 10 days, according to Karissa Kruse, president of the group. 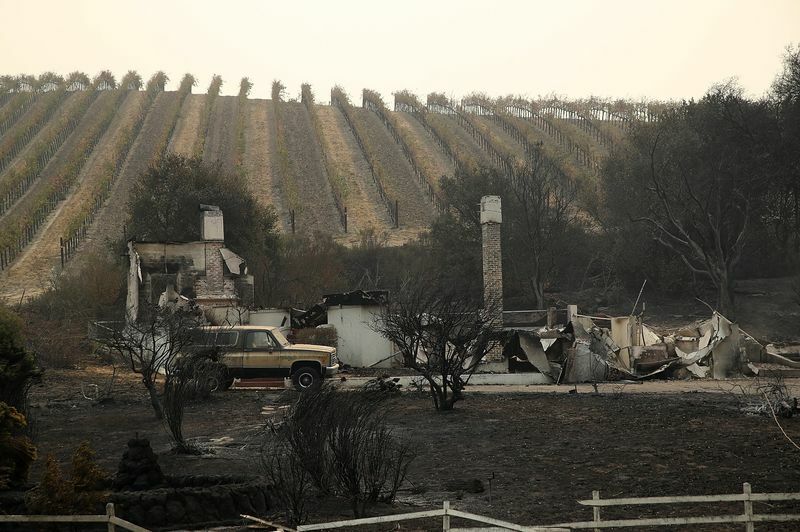 Damages are still being assessed, and reports of fire damage to wineries, businesses and homes are mounting. Sonoma has about 1 million acres, and 6 percent of that is grapes, Kruse said. Sonoma and Napa together produce about 10 percent of California’s wines. Even in vineyards where all the grapes have been collected, there’s the possibility of fire damage to the vines themselves, said Jess Koehler, co-owner of La Finquita Winery in Ramona, outside of San Diego in southern California. Some vintners don’t have details about damage because they’ve been evacuated and can’t yet return to their properties, Rannekleiv of Rabobank said. While anything in tanks should be safe as long as the winery isn’t affected, crops that haven’t been harvested are at risk of both burning and smoke taint, which affects flavor.